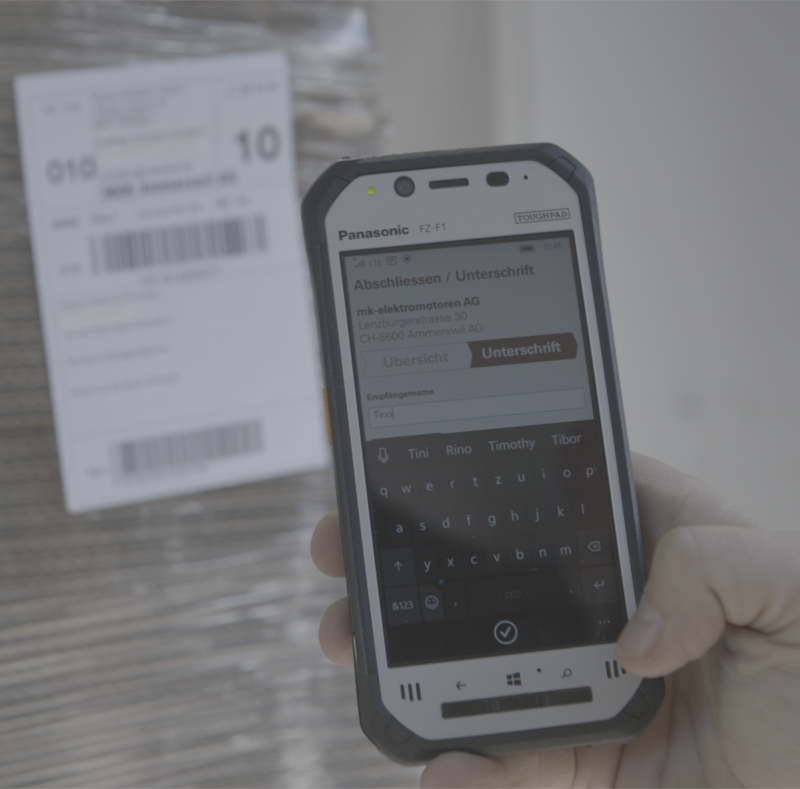 Since 2017, the Swiss logistics company Planzer has been using 2,000 robust TOUGHBOOK handhelds from Panasonic for the transportation logistics of its entire fleet of vehicles. After a year’s experience with this product, we would definitely select it again. Panasonic TOUGHBOOK handheld for use in transportation logistics. Planzer Transport AG is a Swiss, family-run logistics company. With 59 locations in Switzerland and 9 more, mostly in Europe, the company is a leader in its market. Its 5,200 staff work with about 2,000 vehicles and in warehouses of over 1 million square metres. For Planzer, the traceability of goods during transport is very important. Digitalisation plays a decisive role in this area, especially through the use of mobile devices for national cargo and in temperature-controlled transport compliant with GDP guidelines, as well as in its parcel and overnight services. When a shipment is scanned, the drivers receive the order on their device using a specially-developed app. They can view and edit their orders and obtain a digital signature from the customer when the goods are delivered. In exceptional cases where an item has been damaged during collection or delivery, the driver can take a photo on site with the device, attach it to the order and report the problem to the scheduling team. Along with these functions, the devices at Planzer can also be used for phone calls, email and navigation. Before changing over to Panasonic TOUGHBOOK handhelds, Planzer was using ordinary consumer smartphones. However, staff soon realised that these were not suited to the rough usage typical of logistics. “Many devices got badly damaged in no time,” says Miguel Schiltknecht, Technical Project Manager at Planzer. As a result, Planzer decided to introduce hardware better suited to the rough conditions in everyday logistics work. Planzer’s IT department was entrusted with the search and tested various devices during the evaluation process. 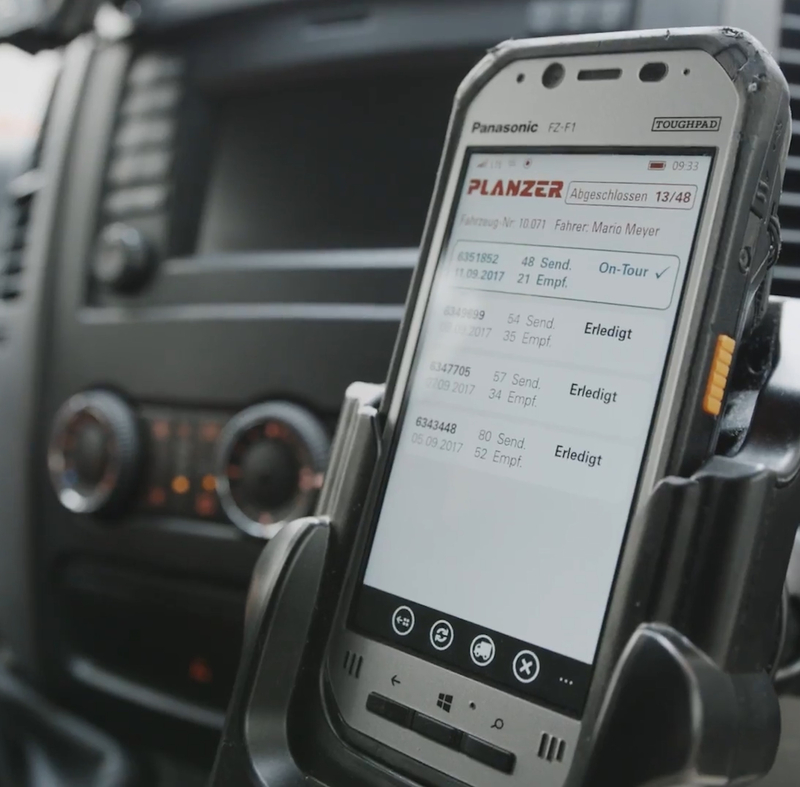 Planzer now uses 2,000 devices for the transportation logistics of its entire vehicle fleet. from a height of up to 2.10 metres. They are also protected to IP68 standard against the infiltration of dust and water and are still reliable at temperatures as low as -20°C. The integrated, ergonomically-angled barcode reader of the device makes Planzer’s work much easier. “We scan twice as fast today compared to the previous device,” explains Lanso Vezhaparambil, Project Manager National Transport at Planzer. After more than a year in use, the feedback has been very positive. Only 3 devices have needed repairs for damage caused in-house. That corresponds to just 0.15% over 12 months. “As the devices very seldom get damaged and are extremely reliable, our costs for repairs, replacement devices, the commissioning of reserve devices etc. are significantly lower than before. And our drivers are hardly ever hampered in their work due to broken devices,” explains Vezhaparambil. “But if one does get damaged, Panasonic provides us with a solution in no time and with no problems,” adds Schiltknecht.